Towards the end of the Apollo programme, an increasing amount of science was carried out by the crews during the flight between the worlds, most of which took place on the homeward leg. Some of this was a precursor to more extensive experimentation that would be carried out on Skylab, the space station that NASA was to launch after the Moon programme had been wound down. Apollo 14 had a heavy schedule of inflight experiments that included: demonstrations of electrophoresis, heat flow and convection in a zero-g environment; how liquids behaved as they transferred between tanks; and a demonstration of the casting of composite materials in space. However, one of the experiments carried out on board Kitty Hawk was not on the flight plan. Some observers have noted how, across the six crews who went to the surface, there seemed to be a divergence of personality types between the guy on the left of the lunar module and the guy on the right. The commander on the left was all businesslike, supremely focused and driven - traits that tended to be carried on into their time after Apollo. The guy on the right, while equally as competent and capable, displayed a tendency to have a more varied life once the mission was over. 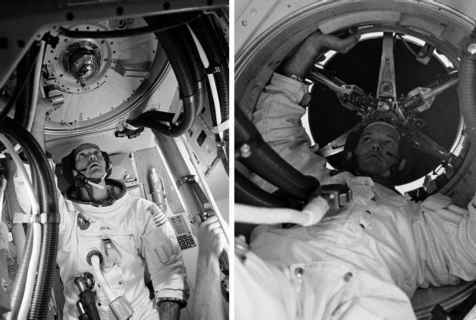 It is unclear whether the astronaut selection process managed to tease apart two different types of pilots from what was a very homogeneous pool, or whether the experience of the mission itself set the course of their future lives. The left-hand crewmen were all mission commanders, and after Apollo they generally went into business, management or similar professions. Among the right-hand crewmen, Schmitt, who was already a scientist, became a politician; Irwin and Duke became evangelists; and Bean took up a career as an artist. Buzz Aldrin had to struggle with depression and alcoholism in the years directly after Apollo, but later became an excellent ambassador for Apollo through his many TV appearances and public lectures. The one remaining LMP in this list, Ed Mitchell, later professed a deep interest in states of being that were outside the physical - consciousness, spirituality and the paranormal. After Apollo, he founded an institute to fund scientific research into these matters, inspired by a "grand epiphany" that he experienced on the way home from the Moon, which he later described as "nothing short of an overwhelming sense of universal connectedness". 1 Zener cards are familiar tools for paranormal researchers. Each card has one of five symbols; a circle, square, cross, star and wavy line. crewmates were settling down to sleep. The participants on Earth had to determine the sequence. The press had a field day with the story when it was revealed a week after their return. However, Mitchell believes his study produced statistically significant results. After his flight, he founded the Institute of Noetic Sciences to continue research into the scientific investigation of the paranormal.